If these bills pass, it will be. But you can help stop it. We rely on our government to ensure so much is safe: The food we eat. The air we breathe. The toys our children play with — and so much more. But right now, legislation is moving in Congress that guts the crucial federal safety protections we rely on to ensure that what surrounds us isn't putting us in danger or making us sick. 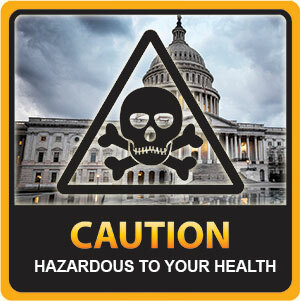 These two pieces of legislation — the Regulatory Accountability Act and the REINS Act — are direct threats to public health that have broad, overarching consequences. In short, they handcuff the government with red tape, making it nearly impossible for agencies to deliver the crucial safeguards we need. These dangerous bills have already passed the House — take action today to stop them in their tracks in the Senate! I'm writing today in strong opposition to the Regulations from the Executive in Need of Scrutiny (REINS) Act of 2017 and the Regulatory Accountability Act, two bills passed by the House of Representatives last year. These are direct threats to public health and safety with extremely broad implications and unintended consequences. They each throw up unprecedented and dangerous roadblocks and delays to the sensible safeguards that protect the American people. For decades, agencies have been tasked with carrying out landmark laws like the Clean Air Act, the Fair Labor Standards Act, the Consumer Product Safety Act, the Toxic Substances Control Act and so much more. Burdensome red tape will only leave Americans unprotected, going back on historic progress made by Congress. If these bills come to the Senate floor for a vote, please strongly oppose them.